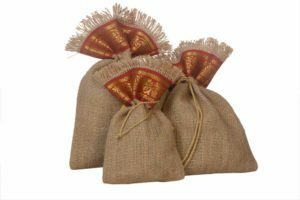 Hessian cloth is a very fine quality jute fabric. It is a plain woven fabric of 5 to 12 ozs, a yard. It is also Burlap. Hessian cloth is used for a wide range of applications. It is exported all over the world both in cloth form, as well as, in the form of bags. Bags are mainly used to store and pack varieties of goods, as well as, commodities such as pulses grain, potato, onion, sugar and tobacco. These bags are available for packing goods of heavy weight. Serim cloth is an extremely light weight Hessian cloth. It is mainly used in the felt industry in order to reinforce the non-woven fabric. It is also used for strengthening paper with lamination. Tobacco sheets are actually made with Hessian cloths. It is used for, as the name suggests, wrapping tobacco leaves for safe transit. Hessian tapes and Gaps are produced from Hessian cloth. These clothes are woven with gaps at regular intervals. The cloth is being cut between the gaps in order to make small width taps. Sacking cloth is also known as heavy goods bag. It is usually made from lower grades of jute fibres. Sacking is heavy. So loosely woven cloth in plain or twill weave, weighting from 15-20 ozs per yard of different widths are used. Sacking cloth is made from jute bags in order to pack food grains, sugar and Cement etc. in a weight range from 50 to 100 kg. Tarpaulin is mainly used for the purpose of covering on a multidimensional scale. Hydrocarbon free jute cloth is actually a hessian fabric, which is free from the presence of hydrocarbon. It is made by treating jute with vegetable oil. These bags are largely used for packing of coffee, cocoa, peanut beans, as well as, other food material. The bags are free from any kind of foul smell such as that of kerosene. Geotextiles are jute cloths, which helps to prevent soil erosion and landslides. These Geotextiles are laid along the river embankments, sides, hill slopes etc. in order to prevent soil erosion. Several decorative items, such as toys, wall hanging, paper, decorative bags, table lamps, furniture, as well as, many other items are being made from jute fabrics. Canvas is the finest jute product. Hence it is closely woven with the best grades of fibre. Jute canvas is quite widely used throughout India for protection from weather. Canvas, as well as, screin lamination with paper polythene are mainly used in the mines. Shopping Bags are manufactured from hessian, as well as, sacking cloths with handles, straps, chains, which comes in different shapes and dimensions. They are used mainly for marketing purpose. They are bleached, as well as, decorated with different artistic designs. Promotional bags are usually sample bags to promote items for sale. Polylined / Polylamined bags are actually hessian or sacking bags with a coated polythene film.